The Spanish guitar is also known as the classical guitar, and it’s an acoustic guitar that uses six nylon or gut strings, resembling the Flamenco guitar – and it’s the most commonly used kind of guitar nowadays. The nylon-based strings are used quite commonly, making the guitar easier for plucking and strumming alike, while also giving it a softer and warmer sound. Additionally, carbon fiber or composite treble strings have been popular lately too – the body tends to be traditionally made from hardwood, like rosewood, while using cedar or spruce for the top. 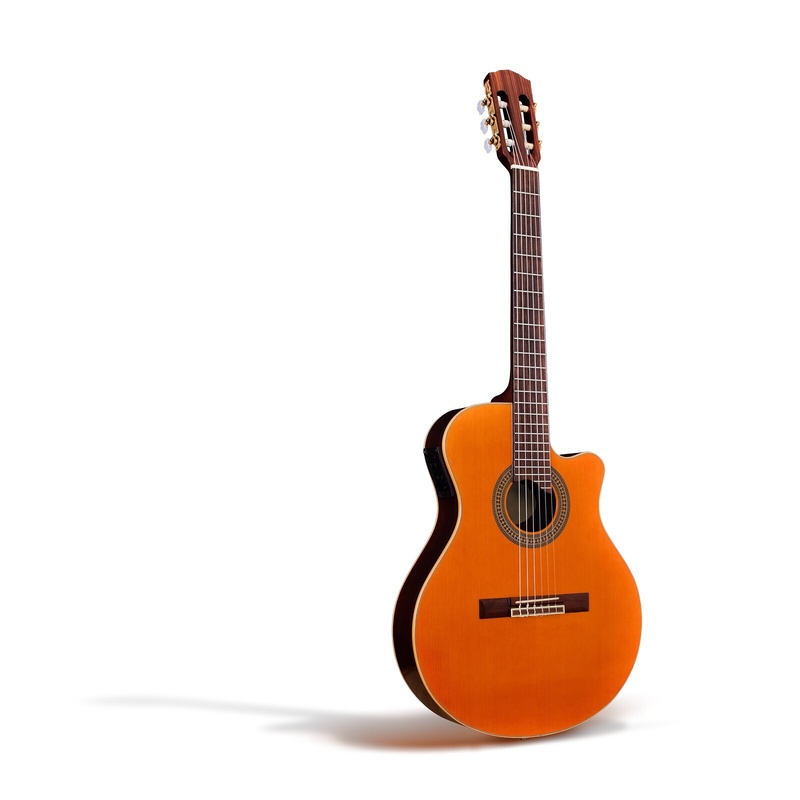 The Spanish guitar sees the most application in classical music, as well as Latin, Flamenco, Folk and other modern styles like rock, country, jazz and pop. This type of guitar is made by numerous manufacturers around the world, with Spain still remaining the main hub for its manufacturing – Ramirez is probably one of the most well-known manufacturers right now. Major electric guitar companies like Epiphone, Ibanez, Fender and Gibson, as well as acoustic/electric manufacturers like Taylor, Ovation and Yamaha, also make various types of Spanish guitars. The history of the Spanish guitar and its predecessor, the baroque guitar, goes for over four centuries, back to the late 18th century, and through to the Renaissance period and most likely from the Greek kithara lyre. Some of the most notable composers and arrangers as well as players of the Spanish guitar include Andres Segovia (1893-1987), Fernando Sor (1778-1893), Francisco Tarrega (1852-1909), Gaspar Sanz (1640-1710) and Josh Williams (1941) – as well as Mauro Giuliani (1781-1829). Nowadays, modern artists like Sting, Willie Nelson, Peter White, Eric Clapton and Eddie Van Halen keep influencing the music world with their use of the Spanish guitar. It’s normally played in “finger style” as well as a combination of the fingertips and the nails. The Spanish guitar is placed on the left leg when playing, and that leg is raised with a footstool – while the right arm holds the guitar in one place. This allows for greater mobility as well as convenient access to the strings and the fingerboard. Normally you wouldn’t use a plectrum or a bow, as using your fingers gives you the ability to produce pure polyphonic music. Spanish/classical guitar music tends to sustain between 2-4 musical lines and voices. You can, however, play the Spanish guitar with a plectrum/bow in pop music. You’ll find the fingerboard to be a bit wider than that on other guitars, giving you more space between the strings for plucking. Nylon strings can give a unique and rich palette of sound to the Spanish guitar. The Spanish guitar is meant to be played acoustically, but electronic pickup systems have been incorporated in many products suited for live performances as well, so it comes down to personal choice for the most part.